NORFOLK, Va. — With Florence now ashore and dissipating from a hurricane into a slow-moving tropical storm, the Navy is calling back most of the ships and aircraft that escaped southern Virginia last week. 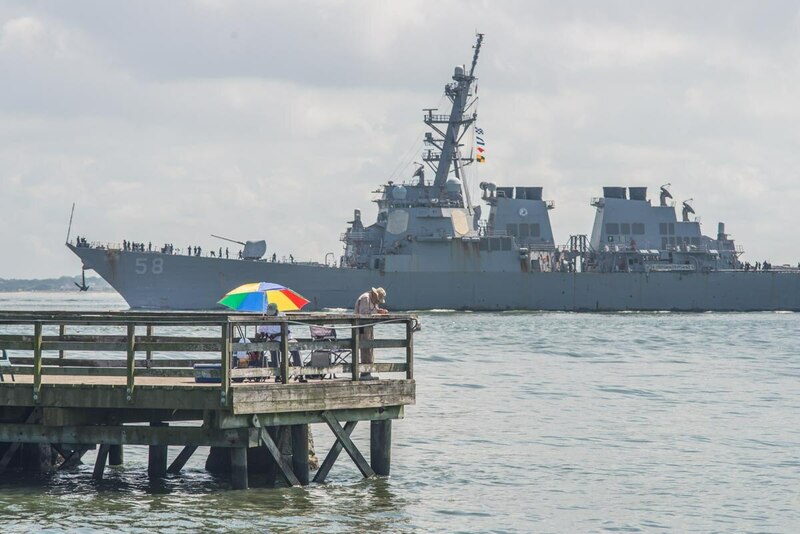 On Saturday morning, Norfolk-based Fleet Forces Command ordered nearly 30 ships and 128 aircraft that sortied to return to Hampton Roads, according to a Navy press release. The order came a day after Navy Region Mid-Atlantic rescinded its mandatory evacuation of all shore-based personnel and families residing in flood-prone areas, greenlighting their return to the Norfolk region as well. In a Saturday afternoon announcement, Navy Region Mid-Atlantic commander Rear Adm. Charles Rock set all Navy installations in the Hampton Roads area at Tropical Cyclone Condition of Readiness Five, removing Florence as a direct threat to military facilities here. That returns shore crews and facilities to normal operating conditions and prepares military and civilian employees to support the return of the vessels and aircraft that left last week. “I am very proud of the hard work and dedication of our total force — sailors, civilians and families — who worked so hard to prepare for a major hurricane in our area,” said Rock in a written statement emailed to Navy Times. Rock’s order allows commissaries and Navy Exchanges to reopen, too. DoD surrounds storm impact area with response forces. Two Navy vessels will remain at sea under the control of Colorado-based Northern Command, however. The amphibious warships Kearsarge and Arlington sailed behind Florence and are ready to respond to the needs of local emergency management officials in the Carolinas, if requested. 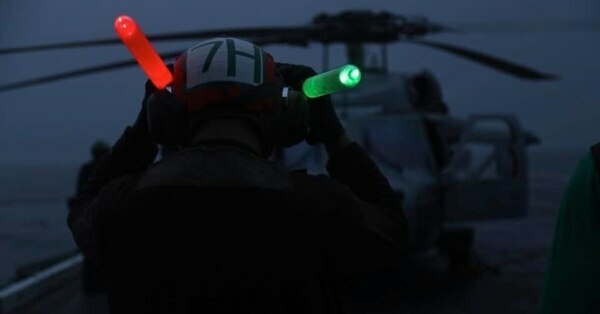 The “Dusty Dogs” of Helicopter Sea Combat Squadron 7 will be on call, too. They departed the aircraft carrier Abraham Lincoln for Norfolk on Saturday morning to provide emergency management officials with land-based rotary wing aircraft, if they need it. Navy aircraft will begin returning to southern Virginia on Saturday. Naval Station Norfolk will give priority to helicopters, which might be needed for rescue and relief efforts, too. Ships and submarines are slated to begin returning on Sunday. 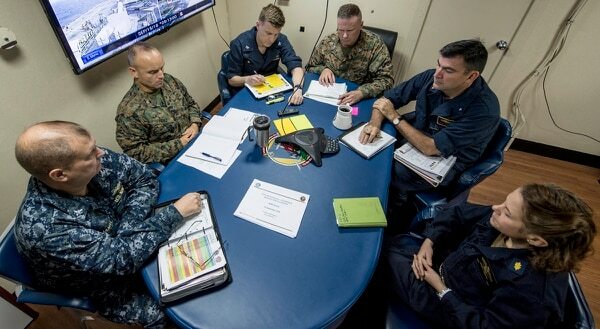 “The decision to return naval assets to their homeport follows thorough inspections of port and airfield prior to opening for operations,” the Fleet Forces Command release said. Fleet Forces Command’s statement was echoed by Coast Guard officials, who reopened civilian ports to commercial traffic on Friday. “Coast Guard Sector Hampton Roads is coordinating very closely with our port partners to ensure a quick and safe recovery from Hurricane Florence,” said Capt. Kevin Carroll, the commander of Sector Hampton Roads, in a written statement sent to Navy Times. On Saturday at noon, Coast Guard officials in Charleston, South Carolina, also reopened that port but the piers in Georgetown remain at condition Zulu until patrol boats can finish waterway danger assessments. 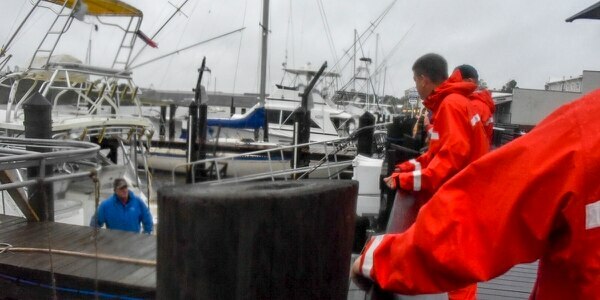 “The Coast Guard in South Carolina is committed to a swift recovery from the storm with search and rescue operations and safety of life as our ongoing priority,” said Capt. John Reed, Sector Charleston’s commander, in a press release. The Coast Guard moves came on the heels of a busy night in North Carolina. Officials at the Coast Guard command post Seymour Johnson Air Force Base in Goldsboro said that they’re speeding up response operations in the northeastern section of the state. Since Florence made landfall around Wrightsville Beach on Friday morning, Coast Guard crews have rescued five people in the Tar Heel state, officials reported. They’ve deployed 35 shallow-water rescue boat teams to the state and continue air rescue operations out of Elizabeth City. “Weather conditions are allowing us to accelerate operations in the northeast portion of the state,” said Capt. Bion Stewart, leader of the Coast Guard’s response to Hurricane Florence in North Carolina, in a written statement emailed to Navy Times. The National Hurricane Center in Miami continues to warn the public about the dangers of Florence, a storm centered about 50 miles west of Myrtle Beach, South Carolina, but trudging toward the Appalachian Mountains at only about 3 miles per hour. It’s expected to turn northwest toward the Ohio Valley by Sunday but life-threatening storm surges continue from Myrtle Beach to the Ocracoke Inlet and Pamlico Sound in North Carolina. Forecasters predict another 15 to 20 inches of rain across coastal North Carolina and far northeast South Carolina, adding to the 30 to 40 inches already drenching the region south of Cape Hatteras. Meteorologists warn of catastrophic flash flooding and rising rivers. A preliminary report from Swansboro indicates that North Carolina community has received more than 30 inches of rain. That breaks the tropical cyclone rainfall record of just over 24 inches for the Tar Heel state set during Hurricane Floyd in 1999.